This month op-eds and letters to the editor in the Arizona Daily Star and other news sources have called for seasoned voters to encourage and support young voters, especially Millennials, in exercising their right to vote. This is especially true in midterm elections when many “mature” voters opt-out of participation in our country’s electoral process. For educators, this is two-pronged responsibility. 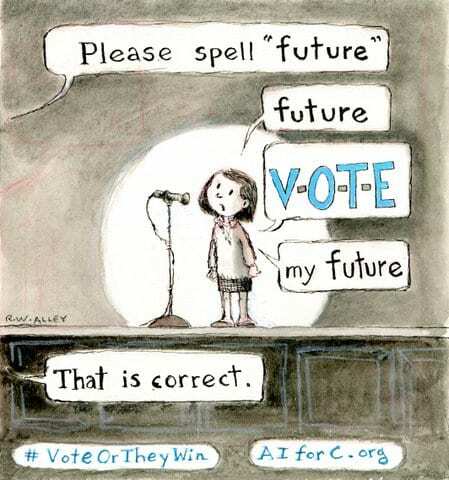 Educators must also support young voters in accepting and cherishing the right to vote. I have been phone banking in Arizona. Many of the voters I have talked with are passionate about exercising their right to vote. As educators, we must share that passion with the young people in our care. Whether or not they are yet eligible to vote, we must teach students the history of enfranchisement in our country and instill in them the importance of participating in all elections—local, state, and national. Last month, Common Sense Media posted an article by Regan McMahon in their “Parents, Media, and Everything In Between” section called “17 Tips to Steer Kids of All Ages Through the Political Season.” Many of these strategies can be used by school librarians and classroom teachers as well. Last summer, I posted resources to support classroom teachers and school librarians in teaching and coteaching civics education. (See below.) This week and next are ideal times to take up this topic in classrooms and libraries across the U.S. Integrating real-world and current events into the curriculum can help students find relevance in their schooling. Focusing reading, research, and discussions on voting can also help strengthen our democracy. Several people have commented on the Forum that school librarians must listen to principals, in particular, and help them solve the challenges they face. By helping principals and other district-level administrators solve problems and serving as coleaders alongside their administrators, school librarians can help others successfully implement change. I invite you to revisit Misti Werle’s virtual podcast interview for Chapter 2: Job-Embedded Professional Development to note how she is leading coteaching practices among Bismarck (North Dakota) Public Schools as a way of addressing school administrators’ priorities. In 2014, my former Texas Woman’s University colleague Teresa Starrett, who teaches school administration courses, and I crowdsourced a video titled “Principals Know: School Librarians Are the Heart of the School.” We put out a nationwide request to school librarians who had experience collaborating with their principals and with classroom teachers. These testimonials, from across the country, document what these school administrators know are the reasons all schools should have a professional school librarian on the faculty who leads a collaborative school library program. The following are transcript excerpts from the videos we received. They were used to create the composite video. From my perspective, these testimonials clearly indicate what all administrators should value and what all school librarians should contribute to their learning communities. I have highlighted some of the keywords in their testimonials. (Note: The administrators’ positions and titles listed were accurate at the time the video was published in 2014). “Principals should stand for what’s important in schools, and having teacher librarians in elementary schools is essential. When you have a teacher librarian in an elementary school, they teach teachers how to be better at their craft, how to help children evaluate sites so that the research they do is meaningful and allows student voices to come out because they truly understand the research that they’re doing. When you work with the teacher librarian, you’re able to grow professionally in a way that’s very non-threatening, very supportive, but accomplishes that raise of rigor in the classroom, and their confidence in being able to complete a research project with their students. There is the opportunity on a day-to-day basis for the teacher librarian to use the skills that she has to improve teaching in classroom teachers. That professional development doesn’t happen on Wednesday afternoons from 1:45 to 2:45. Professional development happens as teacher librarians and classroom teachers collaborate together on projects for their students. For me, all of these testimonials suggest that school librarians’ roles as curriculum developers (#1 on Rebecca Moore’s list) and leaders in job-embedded professional development can be pathways for school librarians to help principals and district-level administrators solve the challenges they face in our schools. How does your principal engage in distributed leadership? What roles do leaders play in your school? One of the long-term trends (five or more years) in the 2017 K-12 Horizon Report is advancing cultures of innovation. As noted in last week’s post, collaboration and leadership are both essential aspects of innovation and change. As innovators and change-makers, school librarians working alongside their administrators and colleagues can be at the forefront in a distributed leadership culture. If innovation is a process of thinking that involves creating something new and better (George Couros paraphrase), then school librarians, as professional developers, will always be seeking improvement. As Senge and his colleagues suggest: schools that learn are “… places where everyone, young and old, would continuously develop and grow in each other’s company; they would be incubation sites for continuous change and growth. If we want the world to improve, in other words, then we need schools that learn” (cited in Moreillon 2018, 10). There are many examples in editors Debbie Abilock, Kristin Fontichiaro, and Violet H. Harada’s book Growing Schools: School Librarians as Professional Developers. I highly recommend Maximizing School Librarian Leadership (MSLL) readers return to that book for examples of the many pathways school librarians have taken in leading professional development. (I would contend that all the examples in Growing Schools required collaboration in order to achieve success!) My chapter in that book provided the foundation for MSLL Chapter 2: Job-Embedded Professional Development. The American Librarian Association is part of a coalition of organizations that focuses a spotlight on Banned Books Week September 23rd – September 29th. School librarians can lead by coteaching and providing professional development focused on “Call Out Censorship.” For inspiration read Jacqueline Higginbotham’s post “What? I am not allowed to read that” and comments on the TxASL Talks: Advocacy for All blog. The discussion questions, activities, and reflection prompts at the end of each chapter in MSLL are designed to position school librarians as professional development leaders. The majority of the questions, activities, and prompts are focused at the building level but can be adapted for other contexts. By guiding MSLL co-readers through these activities, school librarians demonstrate leadership and their impact on adult learning in their schools and districts. For example, one of the activities offered at the end of Chapter One is a job description writing exercise. It starts with the end in mind—the job description of a future ready student. From that foundation, MSLL readers are invited to write job descriptions for any stakeholder in that endeavor. School librarians facilitate these kinds of adult learning activities in order to build trust with and among colleagues, to develop shared values and priorities, and to improve instructional practices in their buildings or at the district level. MSLL readers are encouraged to adapt the book study components of each chapter to their unique learning environments. Developing site-specific or district-level discussion questions is recommended as appropriate. Activities and reflection prompts can also be modified. There are no shortcuts to culture building. Educators must develop trust and invest in their own and each other’s continuous learning. Shared professional development is the way. How do you currently lead professional development in your school? What are your plans for increasing your contributions to your own and to colleagues professional learning this academic year? Abilock, Debbie, Kristin Fontichiaro, and Violet Harada, Eds. 2012. Growing Schools: School Librarians as Professional Developers. Santa Barbara: Libraries Unlimited. New Media Consortium and Consortium for School Networking. 2017. The NMC/CoSN Horizon Report: 2017 K-12 Edition. In this quote from the book, I offer a critical foundation for succeeding in Maximizing School Librarian Leadership. When administrators, educators, students, and families have a collaborative mindset, they will be invested in each other’s success and in the success of the entire learning community. With a culture of collaboration as a foundation, principals and school librarian leaders will have built the necessary relationships to fully understand the system they seek to lead. Like principals, school librarians have a global view of the learning community. Effective school librarians and principals also reach out beyond the school walls to work with families and other community members. A close working relationship between principals and school librarians helps them share their insights into the various components of the learning community. Systems thinking involves taking stock of the whole system before attempting to change any part of it. Systems thinking leaders search for patterns in the interdependent relationships among people and practices within the system. It is important, then, that leaders step into each other’s and every stakeholder’s shoes. School librarian leaders must ask: What does the school library program look like from the perspective of the principal(s), classroom teachers, specialists, staff, families, district-level decision-makers, and community members? Systems thinking helps leaders identify areas of strength. These are the places in the system that support the learning community’s vision, mission, or goals. Leaders also look for stumbling blocks that may impede the school’s progress toward achieving their goals. In a collaborative culture, leaders use this information to further strengthen the system and collectively solve the challenges that could keep educators, students, and families from achieving success. Collaborative school librarians seek to align their work—resources and teaching—with the classroom curriculum. Through coplanning, coteaching, and coassessing student learning outcomes they have first-hand knowledge of the instructional program from a school-wide perspective. Principals and school librarians can use that information to continually improve their own leadership as well as the success of other educators, students, and families. Systems thinking involves working as a team. Team learning “is a discipline of group interaction. Through such techniques as dialogue and skillful discussion, small groups of people transform their collective thinking, learn to mobilize their energies and actions to achieve common goals, and draw forth an intelligence greater than the sum of individual members’ talents” (Senge et al. 2012, 8). School librarians work with individual colleagues as well as with grade-level and disciplinary teams. This gives us the opportunity (and the responsibility) to personalize professional learning for each member of the teaching faculty. Our knowledge of the entire system, which we share with our administrators, helps school librarians collaborate with others to transform teaching and learning. It helps us know how we can capitalize on our colleagues’ individual strengths and the school’s collective strengths. It helps us develop strategies to address any policies, procedures, or practices that may be holding us back. Systems thinking is not a new idea in education. In 1992, the Association for Supervision and Curriculum Development published an issue of Educational Leadership called “Improving School Quality.” Frank Betts contributed an article to that issue called “How Systems Thinking Applies to Education.” As Betts notes, “Each educational system is composed of a unique set of elements arranged in a unique constellation of relationships. Furthermore, the relationships among elements, subsystems, and supra-systems are continually changing in search of equilibrium while avoiding entropy.” As the call for systemic change in education has grown even more urgent in the years since his article was published, there remains much to learned about applying systems thinking to transforming our schools. Taking a systems thinking approach provides school leaders with the data they need to lead a change process. Strong leaders practice distributive leadership and encourage all stakeholders to actively participate in the process. Applying systems thinking and working collaboratively with others is the way to collectively take the risks necessary to maximize our effectiveness and reach for our capacity to meet the needs of today’s students. Do you feel that your school community is currently working together as a team? How do you or could you contribute to strengthening your school’s team? Betts, Frank. 1992. “How Systems Thinking Applies to Education.” Educational Leadership 50 (3); 38-41. Senge, Peter, Nelda Cambron-McCabe, Timothy Lucas, Bryan Smith, Janis Dutton, and Art Kleiner. 2012. Schools That Learn: A Fifth Discipline Fieldbook for Educators, Parents, and Everyone Who Cares about Education. New York: Crown Business. I had intended to review one more #Election2018 resource, iCivics, in this three-post series. However, Connie Williams did an outstanding job sharing this site in her “Got Civics?” post on the Knowledge Quest blog in June so I will simply reinforce her post here. Connie spotlighted the Drafting Board and civics learning games. As Connie noted, educators can expect to find a new game on the iCivics.org site this fall. iCivics is partnering with the Annenberg Public Policy Center to develop this game. Look for it. Educators can set up free accounts in order to access all of the resources on the site. Connecting #Election2018 with digital literacy presents a leadership opportunity for school librarians. “Digital literacy is the ability to use information and communication technologies to find, understand, evaluate, create, and communicate digital information, an ability that requires both cognitive and technical skills” (ALA 2013). The technical skills involve the use of various information and communication technologies. #Election2018 presents an opportune time to coteach digital literacy with educators in every content area. Here are some promising possibilities. As previously noted, The Center for Civics Education Project Citizen offers lessons for upper elementary through post-secondary students. Taught alongside the Stanford History Education Group’s resources, educators can help students develop the critical thinking and information/digital literacy skills they will need to be informed, active citizens. The advanced questioning lesson (for approximate grades 9-10) in my book Coteaching Reading Comprehension Strategies in Secondary School Libraries: Maximizing Your Impact (ALA 2012) uses editorial cartoons as prompts. In the lesson, educators teach and students apply the Question-Answer-Relationships questioning strategy. “The Editorial Cartoons of Clay Bennett” is one of the resources I recommend for this two-part lesson. (Since the publication of my book, this site has been thankfully archived by the Library of Congress.) Of course, your hometown newspaper (in print or online) is likely an outstanding resource for your students. The New York Times The Learning Network offers a wealth of participatory and real-world learning experiences to prompt student learning and support educators’ teaching. During the academic year, the site posts an article of the day, a news quiz, and a student opinion section. The Learning Network offers lesson plans for students in grades 7 and up in core content areas and lessons on topics that build technology skills, too. In conversations with administrators and classroom teachers, school librarians may want to share popular or scholarly articles and research studies that make the case for teaching digital information literacy. These are three recent articles that are well worth reading, discussing, and applying in our professional work. Connie Williams also noted in her KQ post that classroom-library collaboration for civics teaching and learning should not be relegated to civics and government departments only. This and my previous two posts on this blog have focused on ELA-R and social studies/civics connections. What about reaching out to mathematics teachers to study polling or other data that is published during this election cycle? How are candidates talking about topics related to science, such climate change, fossil fuels, and alternative energy sources? What about connecting candidates’ positions and promises related to health care with health or P.E. teachers’ curriculum? How will you use digital texts to strengthen students’ literacy during this election cycle? What are your plans for collaborating with classroom teachers to engage students in digital literacy – locating, comprehending, evaluating, creating, and communicating digital information – in Fall 2018? American Library Association. 2013. Digital Literacy, Libraries, and Public Policy: Report of the Office of Information Technology Policy’s Digital Literacy Task Force. www.districtdispatch.org/wp-content/uploads/2013/01/2012_OITP_digilitreport_1_22_13.pdf.